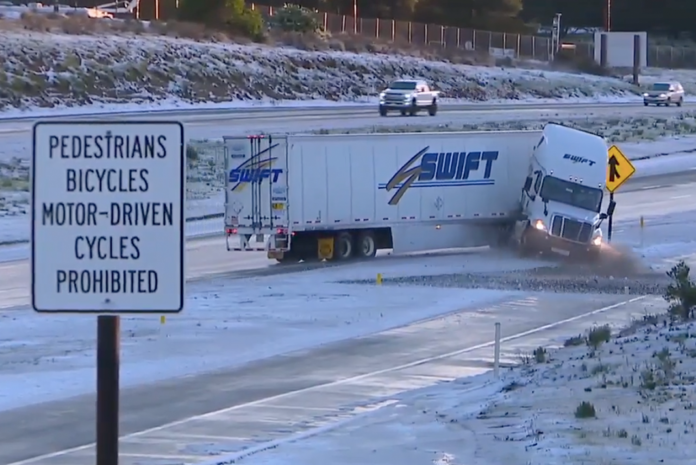 A California news station’s cameras were rolling the moment that semi truck hit a patch of black ice and jackknifed. The incident was captured on film by 10News – ABC San Diego KGTV around 7 a.m. on Friday, February 22, on a black ice-covered stretch of I-8 in the Alpine area. In the news footage, you can see an eastbound semi hit a patch of ice near the Willows Road exit and lose control, going into a hard jackknife. Fortunately, no other vehicles were involved in the crash and no injuries were reported. The incident took place hours after California transportation were forced to close down some portions of I-8 for snow and ice. Since the video was shared on Friday morning, it has gone viral. In just a few hours, it has been shared nearly 4000 times and it has been viewed over 150,000 times. You can view the video for yourself below. WHOA. Our cameras were rolling as a big rig heading eastbound on I-8 in the Alpine area drove over the icy road and spun out.